Love it. Thanks for the instructions. I’m going to try one for my ribbons too. Love the knob on top of the 2nd one. Well done. 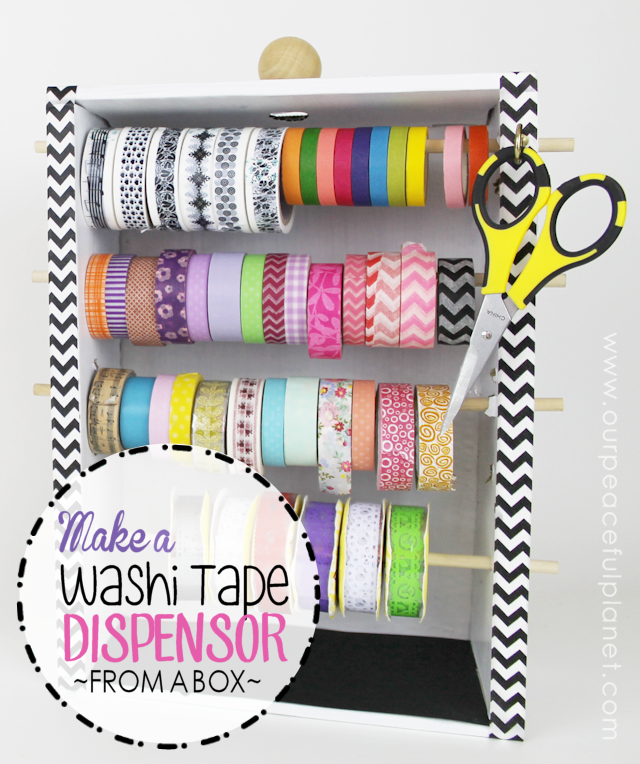 Hello Nancy, just looking at Pinterest and saw this wonderful box for Washi tape. I’m thinking this would also do for ribbon if one doesn’t have an armload!! Did you paint the box? Like the way you made it look like a drawer with the knob on top, easy to carry for sure. You have my mind wandering now. But for now I can get my hands on a box & guess just cover it with white card or something. Anyhow, a wonderful job. Love it. Thank you so much Claire! I pained one and used contact paper on the other. Since it’s cardboard you need to use light paint. I believe I spray painted mine. Thank you for the kind comment! Great idea, can’t wait to make one for Christmas ribbon!! Very good idea! Have you thought about a box with a lid? The lid would keep dust off rolls. Thanks for sharing this idea, I have numerous rolls of ribbon and this will work well. AA lid would certainty work if they are not used often. Thanks for stopping by Jennifer! This is such a great idea! I love how you can see all of the designs you have and it makes it so much easier to use! Thanks Falon. Appreciate you stopping by! This is such an awesome idea! I definitely need to make one. Thank you so much for sharing at Best of the Weekend! Wow! What a great idea! Love it! Pinned it twice….hey, tomorrow night our Wonderful Wednesday Blog Hop goes live. Please come by and share this! Love it! Looks great. I have wash tape envy right now 😀 haha. Just pinned this to my DIY Board! 🙂 Thanks for the inspiration. Next: Where's Your Light? Help When You Struggle to See the Good.